Note that these notes draw heavily on a lecture given two years ago so an references to the “present” are quite likely referring to that time. There are currently 5 approaches to finding extraterrestrial life. One is to look for UFO’s and maybe be abducted. Maybe they’re here. Has anybody here seen a flying saucer? Second hand reports don’t count. Have you seen one yourself you want to tell us about? Maybe we will have time at the end. A second is to listen for radio signals sent out by other civilizations. A third is the astronomical approach. Find the planets out there and look for certain characteristics. The fourth is the go and look directly, which means go to Mars and look for methane and water. There is water elsewhere. It isn’t rare. But Mars is the nearest best bet. The fifth is to look for artifacts on Mars. The most convenient way to check for extraterrestrial life is to look up and see if they are flying around overhead. After all, any other civilized life is probably well ahead of us or well behind us, and if we get wind of a civilization elsewhere it would not be that many centuries before our robot scouts were buzzing them. And there have been reports, even pictures. Here is one of the best. 1870-Mt. Washington, New Hampshire. This photo is dubbed, "the oldest UFO photograph ever taken." This item was the subject of bidding at Ebay in 2002, when finally the photo was purchased for $385.00 by Samuel M. Sherman, who was the president of Independent-International Pictures Corp. This was originally a "stereo" photograph. Certainly it was difficult to manipulate photos at that time, and remember, there were no flying objects then; at least, not from this world. 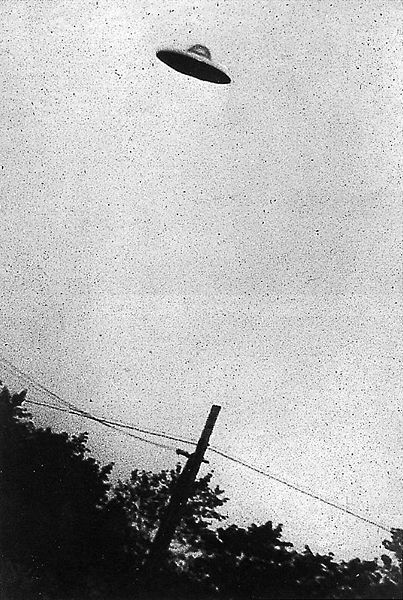 It was taken in 1870 at Mr. Washington, New Hampshire, apparently the first photograph of a UFO. It was taken for a sterioptican, which was an old device with a handle, a couple lenses, a focusing slide and a holder for a pair of stereo pictures. That would be hard to fake even now. Most 3D computer graphics are less than totally persuasive to the eye. The camera they used was a landscape camera, not telephoto, so this must be a vignette. Trick photography had not been invented. Any darkroom manipulation before computer graphics would have resulted in a conspicuously high contrast image. Any support mechanism would have betrayed itself to a landscape camera. There seems no doubt that this is actually what the camera saw in the sky, and there were certainly no human built aircraft at the time. The only technology we have that I can think of that could account for it was to throw a stick up in the air and get a picture of it. Even that might have required a shutter speed unavailable at the time. The picture sold for $385 on Ebay, which seems pretty cheap to me. Computer analysis should show just how far away the object was. Of course it looks like a rotting piece of old two by four. That’s not really a problem. If you had the technology to create a cloaking device and wanted to conceal your spacecraft when it arrived in another galaxy you might have a difficult time making it invisible. People might pick up a clue that something was amiss, some distortion like in the movie “Predator.” That would bring a lot of attention. It might be better just to go there, scan the landscape, pick up something that did not look very interesting and make your craft look like it. That’s done all the time, of course. If you have a Tardis machine it looks like an ordinary police call box. It has even been done by squid. Here are two pictures. One is the squid by itself and another is the same squid sitting next a glob of artificial algae. Popular explanations of UFO’s include sprites, Chinese lanterns, balloons, lenticular clouds, meteors, flying wing, aircraft, planets, sundogs, moondogs, blimps, searchlights and mirage. None of those would account for this thing. But even if you think it looks like an old piece of two by four, consider this. Projectional holograms are a theoretical possibility. One possible cloaking device, particularly for a robot probe, would be to scan some local object and interpose its hologram between itself and a viewer. Here is another from the same web site. It is very impressive, but you see what I mean about the high contrast. That’s suspect, but then if you wanted to make a copy of a photograph before computer scanning, and did not have the negative, you could photograph it. That would give you the same excessive contrast. Here is another. The good grey scale speaks for its authenticity. Decide for yourself whether the image of the UFO is sharper than that of the trees. It shouldn’t be if it was at the same distance and not moving slower. 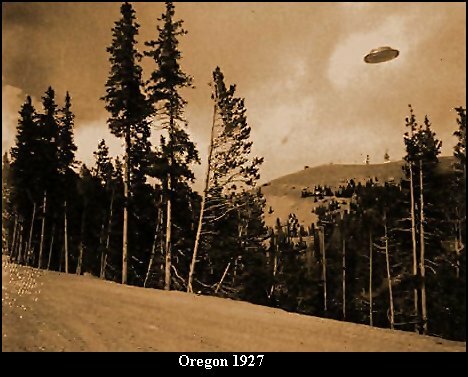 It was taken at Cave Junction in Oregon in 1927. To a certain extent the newer the photograph the worse the technique, so maybe the little green men are getting better at hiding or we are getting worse at throwing things up in the air. In general, the experts say a photograph is not to be trusted any more than the person who brought it to you. In this case it was taken by a volunteer fireman, so at least he had that much civic spirit. 1927-Oregon. Taken in Cave Junction, Oregon. There is some question as to whether the photo was taken in '26 or '27, but nonetheless, if this is an authentic photograph it is incredible. Reportedly snapped by a volunteer fireman. Be sure to click to see full size image to really appreciate the picture. Here is a close up. Whatever you believe, this is an impressive photograph. And given that, you have to consider the possibility of a highly skilled photographer. If the camera was panning with a moving object, it might show the object sharp and everything else blurred. What do you think? Are the vertical lines more blurred than the horizontal ones? Putting the object over a cloud would be an obvious darkroom technique, but the photographer might have chosen a moment with it was superimposed. This past April, there was an article in sort of like, “Aha, the truth at last. It’s all bunk.” It ran to the effect that The Los Angels Times Magazine that month reported 5 men who had worked at “area 51” in Nevada, the secret military research and testing site much beloved of UFO buffs. It is near Roswell, New Mexico, where reportedly an aircraft went down, and pieces were recovered, possibly occupants as well, by the military, who promptly announced they had recovered an alien space craft but soon afterwards said no, it was a weather balloon. (However dumb they think we are, they are probably right.) The men who had been interviewed at area 51 had been working on something they called project A-12 Oxcart. It was a spy plane capable of over 2,000 miles per hour with a disc shaped fuselage. That kind of speed was not reached by the spy plane Blackbird until 1976, so I am rather skeptical that it accounts for sightings in the 1950’s. The Roswell flying saucer story dates to 1947. Still, there is a government web site you can search, http://www.foia.cia.gov/a12oxcart.asp for details on Oxcart. One of the popular early theories of UFO’s was that it was some kind of secret weapon, so saying it was true hardly debunks the UFO tradition. And you know something? I had thought “area 51” itself was a myth. Guess not. There was Project Blue Book, which was a place where people were supposed to send any reports of sightings. That program has now been closed, but it wasn’t for lack of plenty of reports. 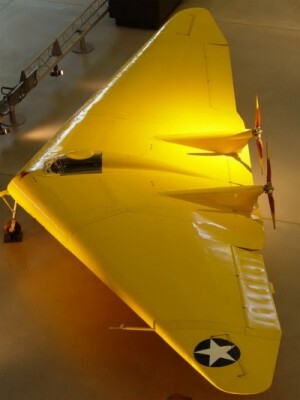 Another project that may have been the cause of reports was the Northrop Flying Wing. It was technology that had been explored by the Germans. The flying wing was dangerous because it was very unstable, but it was noticed that it had a low radar reflection, and that ultimately became the impetus for developing the stealth fighter and stealth bomber, although the practical details were at least in part worked out by a Russian. The “stealth fighter” was in fact a small bomber. It was called a fighter because it was so very maneuverable. The same instability that dogged the flying wing could be exploited as maneuverability once computer controls made the craft safe enough to use. One of the things that astonished early reporters of UFO’s was that they were incredibly fast and appeared to be able to turn at right angles. Imagine this thing coming along side of your aircraft turned cockpit toward you so the pilot could get a look at you and then having it turn edge on. You might be forgiven for thinking it has flown away at an impossible speed. On the subject of “you judge the person not his picture” here is something that came out two years ago : It’s off the internet. The story was that a helicopter pilot flying along the Baleh River in Borneo saw and took this picture of a 100 foot snake that corresponded to a local legend. On the face of it, that does not sound likely. For one thing, flying a helicopter until recently took using both hands and both feet all the time. Autopilot equipment is now available, but probably not in Borneo. So how could he have taken the picture? For another thing, a helicopter pilot lives by ground reference. Instruments aren’t much use because they have to be adjusted, which would mean letting go of critical controls. An airplane pilot generally has one free hand available. So if a helicopter pilot says it is 100 feet, it is not 50 and it is not 200, it is probably very close to 100 feet. But if the snake is 100 feet long, how big are those trees? 1 foot high? 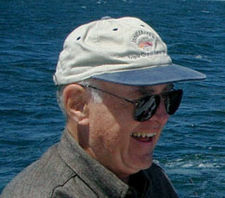 The original picture was found by using a program called TinEye to search the web for a match. The river is supposed to be the Congo. Apparently the picture was made for a hoax contest. I hope they won. The Search for Extra Terrestrial Intelligence goes on. So far there is nothing. Oh well. Not much else to say. They use radio-telescopes to listen to stars. They have to assume that somebody out there is investing enormous resources to send us a signal. This is not being paid for by your tax dollars. 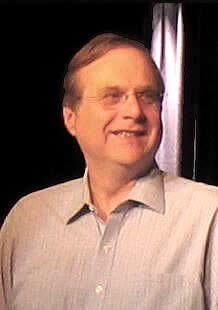 Donors include Gordon More of Intel and Paul Allen of Microsoft. There are nay-sayers who point out that any planet we could talk with is probably 100 light years away, so why bother? But the project has been going on for 50 years already, so it is not a stretch to think people might be taking an interest 200 years from now. That’s if we survive, of course. One thing to bear in mind is that since results are, and probably will continue to be, negative, there is no limit to the resources that could be thrown at it. The static that is being listened to is searched by computer, so that means there is no limit to the computing power that could be thrown at it. A program that made a reasonable model of a real community with real human sized genomes and followed it across generations would require plenty of power, but it seems I am the only one who has done something like that even on a tiny scale. It is now possible to make lasers that for a fabulously brief instant can outshine the sun and be columniated with great precision, so one could shine a light on a target solar system and with appropriate instruments they could see it easily. So people are looking for laser flashes as well. A couple of gestures were made toward sending a message outward. A radio signal was sent. There are those who think it was a bad idea, since we might not want a more advanced civilization to know where they might find a nice planet and some slaves. But not to worry. The message was beamed toward a group of stars called a globular where, as we will mention later, there are unlikely to be planets. However, it did get an answer, in the form of a crop circle. Although the outward bound message is quite incomprehensible to me even after it has been explained and I can recognize some of the symbols, somebody understood it because the crop circle translates into the same code. It is laid out in a pamphlet “The Face and the Message,” John Michell, Gothic Images Publications, PO Box 2568 Glastonbury, Somerset BA6 8XR UK 2002, but apparently it is out of print and I was unable to get copies for you. The outbound message of course has not reached the globular cluster yet. Another thoroughly baffling message was sent out on a plaque on a space probe that was going beyond the solar system. Do not expect a reply to that one. 3. The astronomical approach. A reference for this is The Search for Life Continued, Planets Around Other Stars, Barrie W. Jones, Praxis Publishing, Chichester UK 2008. If looking up for flying saucers seems less than completely satisfying, one could look for planets they might come from and where some century we might go. There are a lot of planets out there. More are being found all the time. At least 330 have been identified at present. One calculation by Duncan Forgan of the University of Edinburgh (ATLANTIS RISING #75, May/June 2009 page 11) suggests there are 37,964 inhabitable worlds in our galaxy. (I don’t know whether that includes this one.) But that calculation apparently only takes into account water (which is common as dirt), minerals (which are going to be there if the temperature is right) and temperature. Of course what you’d really like is to have just the right amount of volcanic activity. Too much really messes things up. Too little and material that gets covered up doesn’t come up to get recycled. So maybe we ought to have 4,000 not 40,000 planets. Then of course you want to have both land and water. That’s where life is most abundant, where the two come together. That’s where people live, too. I think I hear that most of the US population lives in counties adjacent to seacoast or great rivers. And to have oceans, you have to have oceanic tectonic plates. I used to think that the earth’s surface was sort of round with a superimposed random irregularity, and that the oceans just filled the low bits. It turns out that the geology under the oceans is different from the geology under the continents. It’s heavier and sinks into the magma, so that there are great abysmal planes under the sea of about the same depth, just as there are great planes on the land. So that means you should probably drop that 4,000 to 400. And you’d want it gently stirred by tides, so things don’t stagnate and material can shift around, particularly near the shores where the life is. So you need a moon, almost a twin planet. That can’t be common. Maybe you shouldn’t expect more than 10. And you want to have just the right amount of water. If the sea level were 1,000 feet lower, it would be below the level of the continental shelves and those brave little amphibians we all know about would have had to scale thousand foot cliffs before they could catch a breath. A thousand feet higher and there wouldn’t be enough land sticking up to be of much interest. So we should probably drop that 10 to 1. And then you don’t want to be where the bulk of the universe is, near the core of the galaxy, or magnetars and supernovae would fry your planet on a regular basis. And you want just the right amount of tilt on your axis to get seasons that are gentle enough to survive but vigorous enough to stimulate diversification. But wait. We know we have 1 planet so there must be something wrong with my reasoning. Basically it all probably hangs on something called the “ice line.” Planets probably form from accretion discs, sort of like the rings of Saturn. Somehow the stuff globs up and gives you planets. If the globs are too far from the sun, ice can form. If a little boy throws something, he traditionally has a choice of missiles. Rocks are dangerous as Goliath learned. Dirt clods are good, but have to be handled carefully or they crumble. And it is hard to pack your own dirt clod. But if you life up north, you can make snowballs. They are easy to pack. You don’t read about it much, but if a boy can pack a snowball, maybe collisions between icy things in the solar system pack easily. Water is not rare, so these planets outside the ice line get really big, big enough to draw in huge amounts of light gasses like helium. They are the gas giants of our solar system. If they have a surface at all, it is so deep that sunlight is effectively excluded. You might get microbes somehow, but not what we are looking for. And if a glob is to close to the sun, there is the problem with the heat being too great for organic molecules to be stable. So there is a habitable zone, which for our sun extends from just about Venus to just past Mars. We came really close to having three pretty good planets right at hand. There is a band of icy material away out where Pluto sits and beyond. It’s called the Kuiper. It’s like the asteroid belt except that it’s ice not rock. For a while it seemed that Kuiper belts were common but asteroid belts were rare. That did not bode well for there being many habitable planets. The search for extra-solar planets now includes looking for the telltale wobble in a star that would be caused by a planet circling around it, good old astrometry. It seems pretty obvious, but so far only one planet that was already known has been seen this way. A second candidate awaits verification. Another technique is called “microlensing.” Light is bent as it passes a massive object such as a galaxy. This results in magnification. Sometimes a small field of sky will hold multiple images of a galaxy caused by the light bending of an intervening galaxy. That is called lensing. 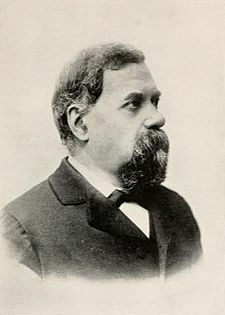 When a single star does the same to a more distant star, the more distant star is projected forward as an Einstein ring circling the nearer star. And the brightness of the ring, as I would not have guessed, is independent of the mass of the lensing star. So when one star passes behind the other there is a brief flash as the Einstein ring forms and fades. It is the duration of the flash that is proportional to the mass of the nearer star. In fact, under the right circumstances a planet around that star will give a flash about as bright but much briefer. It looks kind of like the graph below. The graph is taken from The Search for Life Continued, mentioned above. It is on page 131. In fact a good portion of this part of the session might best be called a review of the book. So if you want to have the hard science presented in a professional way, look it up. But hurry. The field is changing so fast that just about everything I am saying and a lot of what he is saying is probably wrong. In this diagram, the horizontal line is time and the vertical line is the brightness of the star. Microlensing makes it possible to do surveys for planets at enormous distances. They appear to have discovered that “globular clusters” of stars, which are very old stars, have few if any planets. The thought now is that the stars are so very old that the matter in them has not been cycled through supernovae, which is how most matter heavier than hydrogen or helium is formed. Elsewhere, it appears that there are fewer planets way out there than are seen by other means closer to home. Maybe we live in a planet rich zone. Another way to tell that a planet is present is to watch the star carefully. If a planet passes in front of it, the star will dim very slightly but quite predictable. 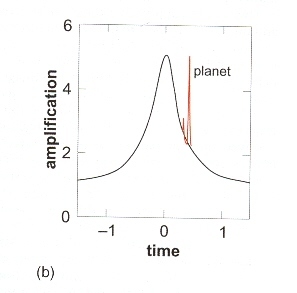 Most of the extra-solar planets have been found by Doppler shift. You know how when you watch a stock car race that sound of the cars drops to a lower key as they go past. That’s because the sound waves are stretched out as the cars move away. Similarly the color of a star changes to redder if it is moving away or bluer if it is coming toward you. They don’t just measure the average color of the star. They break the light up into different wavelengths, and look at them. Different atoms and ions in the star will absorb light at specific wavelengths and then radiate the energy away at lower frequencies. The result is a set of absorption bands in the spectrum. What they measure is the position of the absorption bands. If these shift back and forth regularly there should be a planet out there. What they found initially was a great number of giant planets very close to their respective stars. That was no surprise, since a big fast shift would be the easiest to see. But then they found so many of them that it became a puzzle. Big planets are expected to form far from a star, out where water freezes. There just isn’t enough rocky matter in a typical accretion disc around a star to make a big planet. But if it’s cold, ice can add to the gravity of the planet and hydrogen and helium settle in easily. So what were all these giants doing inside the ice line? Well, they had to move there from where they formed. So people did some computations and found that a giant planet forming in a accretion disc (that’s a lot of stuff in a circular arrangement around a star, just like the rings of Saturn) would introduce inhomogeneity in the disc itself. As the planet interacted with the inhomogeneous matter, energy was lost and the planet would move inward. Then they had to scramble to explain why ALL giants didn’t move in close to their stars. It would be a bad thing if they did. If Jupiter dropped past on its way to somewhere between Mercury and Venus, it would probably throw us somewhere other than the habitable zone. Then they had to figure out why the ones that did move seemed to stop. As I said, this is a new and rapidly changing field. In fact, one of the safest places may be on a moon of a giant planet that has worked its way into the habitable zone. I was quite surprised to learn that the sun has an accretion disc. You can see it. (I have not yet seen it myself.) On a clear night before dawn or after sunset and away from other lights, it is a faint white line in the plane of the planets. Work continues. There are even plans to make telescopes so big they will be able to see lots of extra-solar planets. Astrometry will tell you a lot about a planet like its mass and a lot about its orbit. But in order to be able to estimate temperature, composition and surface gravity, you need more than one technique on one planet. After all this, if “after” is a good word in a field that is just beginning to stretch it legs, so far the smallest planet they have found is 5 times the mass of the earth and probably has a surface gravity of less than twice that of the earth. It is around Bernard’s star, at about 20.5 light years away. Bernard’s star is a brown dwarf, which means it is probably very old indeed. The planet is within the habitable zone. In short, it is to my thinking a very good choice for a habitable planet. And at that distance, if that planet had been beaming signals to us that arrived 50 years ago, we might have picked them up, sent a message to them and got our first reply. In further work, they have tried looking at the edge of the shadow of the earth during a partial lunar eclipse to see what kind of absorption pattern our own atmosphere has. Then they will be ready to look at subtle effects of absorption of the atmospheres of planets in transit in front of their stars and see if they are earth like. Interesting things turn up. There is the “three body problem.” Newton’s laws of motion work just fine to describe how two bodies interact. However when there are three bodies, there is no algebraic solution, at least there wasn’t one until recently if even now. So it was assumed that any binary star could not have planets. If our scientists couldn’t figure out where it was supposed to go, how could some dumb rock? But they’ve found plants in binary star systems. And super-nova remnants. They shouldn’t have planets. The explosions should have swallowed them or driven them away. But there they are. When I was a child, there was already speculation about life on Mars. Personally I was skeptical. In those days nights were dark, air was clean, and you could see the night sky. Mars was red. It was the color of red subsoil. As far as I was concerned that ended the matter. It was a planet of dusty red dirt. There were no lakes, no forests and there was no black soil. There was no life. It seemed odd that anyone should ever think otherwise. On the other hand Venus was white. It was the color of cumulonimbus clouds. That meant rain cool rain. That meant water. That meant life. Besides, I read that it was about the size of the Earth. Not for the last time, I was completely off base. Venus is hot and dry. The clouds are sulfuric acid. Life seems very unlikely there. Mars, however, continues to intrigue people. took an interest in observations by Giovanni Schiaperelli of Milan of what appeared to be channels or canals on the surface of Mars. Lowell decided that Mars was dry. Maybe he had seen dirt before, too. He suggested that canals had been built by a dying civilization to capture ice from Mars’s ice caps. 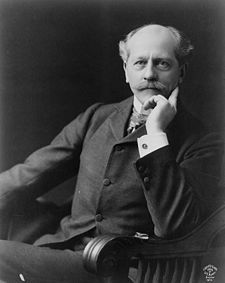 Although Lowell did a number of interesting things – he built an observatory at Flagstaff, Arizona, the first ever located deliberately where the seeing would be good, and initiated the search that ultimately resulted in the discovery of Pluto – his belief in intelligent life on Mars, and I rather suspect his amateur status, drew a lot of criticism. Professional scientists, I fear, have a difficult time with other people who do the same work for free. Somebody didn’t like Lowell. Anyway, they have dug on Mars and come up with plain old ordinary ice. Pluto, which his program found, has been stripped of its honor as a planet. I once saw images of Pluto and some of the other objects that are now also called dwarf planets. Only Pluto looked round to my eye. And the channels have been declared an optical illusion. Picture from The Planetary Police, NATURE, vol.459 no. 7245 May 21, 2009 page 309. Sorry I had to turn it sideways to get it on the screen. This shows much of the surface of Mars. Areas above and below the white lines (outside the white lines as shown here) are near enough to the poles so that water is suspected within 5 meters of the surface, and extra precautions are taken to avoid contaminating them with probes from earth. As time goes on, the less protected area is expected to shrink. For our purposes, the question is whether that linear structure in the lower center is big enough to see from the earth. This is a false color image, which makes it more conspicuous. To my eye, if the image of Mars as seen from your telescope is anything but tiny, that will be visible. In that case, Schiaperelli and Lowell may have been over enthusiastic and seen more channels than were there, but they were not victims of sheer illusion. Here is an upright view of the same area from Google Mars. Artificial canals, no, I don’t think so. But I can well imagine a careful observer looking over a long time under changing light conditions could conclude something was there. Someone with less interest might see nothing after a cursory glance. At least Lowell did not suffer Bruno’s fate. Phoenix Rose Again, But Not All Worked Out as Planned, Richard A. Kerr, SCIENCE vol. 323 no. 5916 February 13, 2009 page 843. The tweed pattern is from my scanner. Mars is not tweed. And liquid water? Well, yes. Here are 3 a pictures of one of the legs of the lander. According to Nitton Renno, one of the chief scientists of the expedition, the heat of the landing melted some of the ice and mud splashed onto a leg. Enough water was vaporized so that salts in the mud sucked up enough moisture to be liquid. The green spots are two droplets that merged while the pictures were being taken. Picture from Water on Mars, ECONOMIST March 21, 2009 page 88. They tell us that there are areas on Mars where there is ample water, the soil chemistry is adequate and there is enough sunlight. All you have to do is warm it up and plant asparagus, which seems to be a favorite vegetable in these discussions. And you shouldn’t have to pull weeds or spray for bugs. You might not have to warm it up that much. According to The Search for Life Continued, there are times and places on Mars where the surface temperature is 7o centigrade. That’s sweater weather. You don’t have to warm it up. You just have to keep it from getting cold again. There is methane on Mars. We all know methane. It is the byproduct of digesting vegetables. If you want to pass less gas, you can shift your diet to more meat and less vegetables and let cows do your farting for you. However meat flatus smells worse than vegetable flatus. There are two mysteries about Martian methane. Where it comes from and where it goes. It is released in plumes by local sources, just as it is on earth. Martian methane plumes are as big as the plume at Coal Oil Seep in Santa Barbara, California. (Strong Release of Methane on Mars in the Northern Summer 2003, Michael J. Mumma and others, SCIENCE vol. 323 February 20, 2009 page 1041) Terrestrial plumes are mostly organic in nature. That is, they are the byproduct of living things. So it becomes a question as to whether the Martian plumes are also. And the methane disappears very rapidly. The mechanism that is expected on Mars is photochemistry. UV light knocks it apart. But it disappears 600 times faster. If it was removed at the expected rate, it would be uniform in concentration all over the planet, but it is not. One possible explanation is that there is something in the Martian atmosphere that is very destructive to organic chemicals. (Observed Variations of Methane on Mars Unexplained by Known Atmospheric Chemistry and Physics, Franck Lefèvre and François Forget, NATURE, vol. 460 no. 7256 August 6. 2009 page 720) Another distant possibility, which is not completely inconsistent, is that there is some sort of life form that eats it. So how are they going to be able to tell whether the methane on Mars comes from some geological process or is the result of life? I wrote Dr. Mumma of NASA and asked, and I got a very kind reply. Here is his letter to you. Actually he knew it was for you. “ document.write(msg.body); The key isotopic measurements are on C13/C12 and D/H. C13 and D are used in different ways by biology and geology, so the isotopic ratio in released methane is an important clue to its production. This approach is used on Earth to distinguish biotic and abiotic production. Another test is to search for related chemicals that are produced geologically (ethane, methane, ...) or biologically (H2S, N2O, etc.). The SAM instrument package on the Mars Science Laboratory (launch 2011) will make some of these measurements, if it is placed at the right landing site. They are taking it very seriously, on October 7. a couple years ago, NASA sent out a mission from Cape Canaveral, but in a boat, not a rocket. (Living where the Sun Don’t Shine, ECONOMIST vol. 393. no. 8652 October 10, 2009 page 83) It will examine thermal vents, starting with one near the Grand Cayman Island in the Caribbean. Current thinking is that life on earth is 3.5 billion years old, but there has only been photosynthesis for 2.4 billion. Before that life had some other energy source, one possibility being the reaction of iron and aluminum deposits with water releasing hydrogen. So if NASA is suddenly studying thermal vents it looks like they are trying to learn more about them before the next Mars mission. So some day soon we may know. There have been 16,268 visitors so far.